When it comes to mealtime for older children, some tricky situations can come up that leave parents wondering, “What should I do here?” Here are some common issues and what I believe to be good policies to have for mealtime. We had a run when a child would either look at a food or try a food and then say “blah!” One problem with this is that it is bad manners. I didn’t have my feelings hurt over it, but I don’t really want my children eating other people’s food and saying, “blah!” My major problem with the “blah” practice was that every child younger than the one saying “blah” then decided she also thought the food was “blah” even if she had been eating it up. We started with just explaining that we don’t say “blah.” Just having a conversation about it wasn’t enough, however. We had to move to “If you say “blah,” you will go sit in the office for five minutes.” The first time someone had to leave the table for five minutes really had a positive impact on the “blah” at the table. Five minutes feels like an eternity to a child. It is a long time. Long enough they didn’t want to say “blah” anymore. It wasn’t worth it to them. 2-You have to try food. Sometimes you even have to eat it. My children all know they have to at least try the food. Sometimes I even give them food I know they don’t like. I think I have shared this in the past, but Brayden doesn’t like corn. Every so often, I require him to try it. Tastes change and I want him trying it every so often to see if he likes it. I only require a couple of bites. Sometimes we have meals that aren’t a favorite of a child. I have shared before that I always make sure there is something in the meal that each child will like. I serve a small amount of a food that is going to be questionable and require the child to eat all of that food at the meal. I make sure it isn’t possibly enough to make the child way too full. I require this for nutritional value, not just to be a mean parent with authority. I explain this to my children as well. I tell the child who doesn’t want to eat the food that my job is to make sure she is healthy and that she needs to eat variety in her diet. I help cheer her along and encourage her as she goes to get the food down. If ever a child is really struggling to eat a food (and let’s be honest here, that child is Kaitlyn), and we are having dessert that night, I tell her it doesn’t hurt my feelings if she doesn’t eat dessert. She knows if she doesn’t eat enough healthy food, she won’t get the dessert. I have explained that dessert is fun and it tastes good, but it isn’t a requirement for her to live and it won’t hurt my feelings if she doesn’t get dessert. I am basically letting her know that puppy dog eyes and batting of eyelashes won’t sway me into changing the policy. I also explain that what will hurt my feelings is if she isn’t healthy. I think it is polite and appropriate for a child to ask permission to leave the table. I like to look over what was eaten and be sure it was reasonable. If it wasn’t, I can require something like that the carrots are finished before the child can be excused. I also think it is reasonable for a child to remove his/her dishes from the table and take them to the sink. We also might have someone sweep the floor after dinner, someone help clear the table, someone help with the dishes, etc. We have a chore wheel for these after-dinner type chores. If your child makes a huge mess at the meal, don’t be afraid to require that child to help clean up the mess. And I am all for patience, but sometimes there is use crying over spilled milk. Yes, this really has to be a policy for a couple of our children. Facing the table prevents food from landing all over the floor. It also keeps the children involved in the mealtime conversation. I mostly have this rule for the mess-factor. This is another one of those policies that seems like a silly policy to even have to state, but any of us with children know this is a legitimate policy that actually needs to be said. The trick here is that I want my children to enjoy family meal time. I want them to be able to laugh together and have fond memories of our meals when they look back on them. What I don’t want is thumb wars that lead to food all over the floor. I don’t want toys through food. I don’t even want grand, waving arms knocking over drinks. There is a time an a place for that kind of play, and the dinner table isn’t it. But we can still enjoy ourselves even if we aren’t wild and crazy while we eat. This is a policy we have. You will have to decide what manners you want to enforce at the table. “Please pass…” and “Excuse me…” are a couple of good phrases. We like chewing with our mouths closed. We like waiting your turn to speak. I already mentioned that we don’t say “blah” and we ask to be excused. Decide on the manners you want your children to learn, and work on the ones you want your children to have in and out of the home. You can’t expect your child to have manners in a restaurant or at Aunt Martha’s that haven’t ever been taught AND practiced at home. I think a big question people have is “What is a reasonable amount of food for my child?” I would advise you to observe your child and understand what is reasonable for each individual. I try to only serve the amount of food for each child that I know is reasonable for that child. Brayden is always given bigger portions than Kaitlyn–unless it is a rare food that she likes and he doesn’t. I have different expectations for each child because I believe fair and equal are different. I don’t have a policy that everything needs to be eaten off of the plate. I might require a certain food to be eaten, but not everything given. I give what I think they will eat, but if they eat less than what I give, that is okay. We don’t do grazing around here, so I know my kids will eat what they need to eat in order to be satisfied until the next meal. I trust that they can identify when they are full and when they are not. I don’t allow seconds on a favorite part of the meal until the vegetables have been eaten. That is really the only food group I watch to make sure enough has been eaten, and to be honest, it is really only one child I have to watch that with. As you set your policies, do so with the intent to have a nice eating environment where children can eat a healthy meal and the family can spend good time together. Do not try to turn it into a battleground or a place to dread. You can have policies and harmonies. 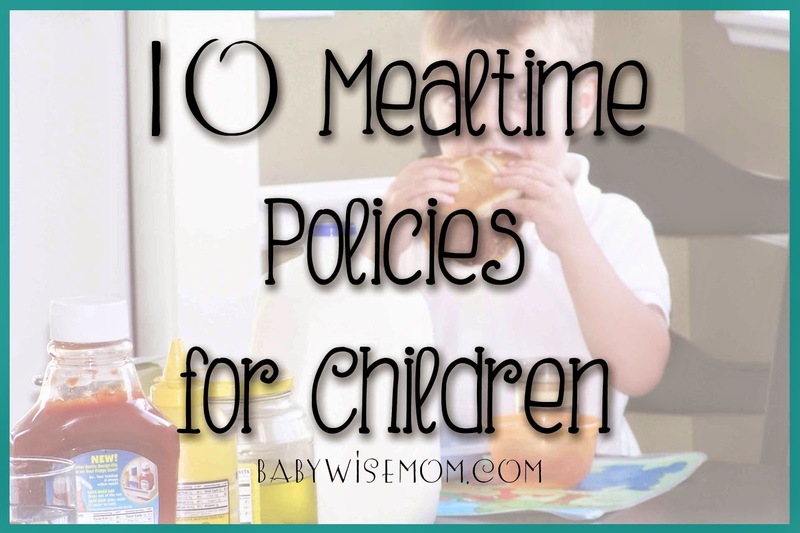 What mealtime policies do you have? Any questions on mealtime policies?